WASHINGTON — At least one journalist and four American immigration attorneys have been stopped and questioned at border stations in Arizona and Texas in recent months, according to their interviews with NBC News. These are in addition to 59 others whose names were on a list to be pulled aside by border agents in San Diego.NBC News and KNSD-TV were first to report about the list, titled "Migrant Caravan FY-2019 Suspected Organizers, Coordinators, Instigators, and Media," which included pictures and biographic information on the individuals, most of whom are American. A spokesman for Customs and Border Protection told NBC News that the Department of Homeland Security's inspector general was investigating the practice, which he said was specific to San Diego.But Taylor Levy and Hector Ruiz, whose names were not included on the San Diego list, were stopped 700 miles to the east in El Paso, Texas. 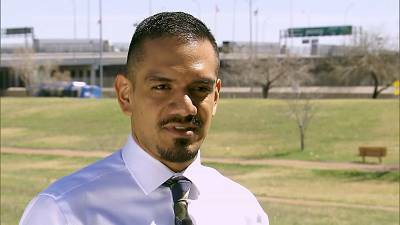 Levy and Ruiz both provide legal assistance to asylum seekers on the U.S. and Mexican sides of the border.Ruiz, a staff attorney with the Santa Fe Dreamers Project, says he was stopped one night in mid-December, after returning on foot from dinner with friends in Juarez, Mexico. Several agents who he says told him they specialize in criminal and terrorism cases asked him specific questions about his job and his political beliefs. "They asked me what my opinion was on the administration, just generally. And how we are doing economically," Ruiz said. "I was treated like a criminal, people were shouting at me," he added. After four hours at the station, he says he finally agreed to unlock his phone and watched as they scrolled through his contacts. He worries about the information they might have gleaned about the clients he works with. According to Ruiz, the agents told him it was their job to keep the country safe, a line similar to what Levy says she heard a few weeks later, when she was stopped at another crossing into El Paso on Jan. 3. Levy is a legal coordinator for Annunciation House, a Catholic charity that provides shelter to immigrants on both sides of the southern border.When she approached the border crossing in her car at 10:30 p.m., she says she could tell something was different and believes she had been flagged in advance.She says four agents escorted her into the station, where, after waiting two hours, another agent dressed in plain clothes came to question her. He told her they had to wake him up at home to come in to question her. According to Levy, the agent told her she was not being detained, but she was being arrested and that she would be arrested if she refused to answer his questions. He also told her she had no right to an attorney.She says she asked to call her teenage daughter, to let her know she would be home late. The agent refused, and instead called her daughter himself. "He also repeatedly asked me about my clients and what my clients tell me," Levy said.After 45 minutes, she says, she refused to answer any more questions. The agent left the room, saying he was going to call someone to come arrest her. Instead, he came back and told her she would not be arrested, but she needed to unlock her phone. She refused again. "And at that point I said, 'No, I'm not going to unlock my phone. I've told you I'm a legal professional and it has confidential client information on it,'" Levy said.Then, says Levy, the agent decided to let her go. As she left, he told her that she might be questioned every time she crossed the border. And Levy has not crossed the border since.In addition to Levy and Ruiz, two other legal workers with the Santa Fe Dreamers Project said they were stopped in Nogales, Arizona, and a documentary journalist from Durham, North Carolina said he was stopped in El Paso.In a statement, a CBP spokesperson said, "CBP has received the allegations, is reviewing them, and requests additional information from NBC News so we can conduct a thorough review of the facts. … If misconduct is substantiated, appropriate corrective action will be initiated. CBP is fully committed to earning the public trust through accountability and transparency within the law. "DHS did not respond to a request for comment. The DHS Office of Inspector General declined to say whether it would expand its probe to other parts of the border beyond El Paso.DHS officials have said there is no policy that targets lawyers and journalists, but they do have broad authority in who they choose to stop for screening. "The border environment is a very complicated environment," said John Sandweg, former acting general counsel for the Department of Homeland Security under the Obama administration. "One thing this case is highlighting is the limited rights that individuals have in the border environment. That said, trying to dig into individuals' political views is wildly inappropriate and would absolutely violate the Constitution, especially for United States citizens. "The House Homeland Security Committee has also sent a letter to DHS Secretary Kirstjen Nielsen, asking for a copy of the list and the reason for its existence. Aides for the committee have said they will not hesitate to widen the probe beyond San Diego if there is evidence that the practice is occurring border-wide.